This study investigated the impact of a project-based graduate practicum experience that was facilitated online. The study investigated the effects of the online practicum experience by: (a) using quantitative data to assess the learning and professional growth of the practicum participants in comparison to a group of teachers that did not participate in the practicum experience, and (b) identifying the qualitative components of the practicum experience that facilitated successful completion and implementation of best practice teaching skills of the practicum participants. Findings indicated that teachers did change instructional practices as a result of the practicum experience, and identified three critical components of the online practicum: (a) use of meaningful learning activities, (b) collaborative learning communities, (c) structure of the practicum project. Effective use of these components can facilitate significant professional growth for inservice teachers engaged in online practicum experiences. Frey, T. (2008). Determining the Impact of Online Practicum Facilitation for Inservice Teachers. Journal of Technology and Teacher Education, 16 (2), 181-210. Waynesville, NC USA: Society for Information Technology & Teacher Education. Retrieved April 25, 2019 from https://www.learntechlib.org/primary/p/23493/. Cohen , J . (1988) . Statistical power analysis for the behavioral sciences (2nd ed .) . Hillsdale , NJ: Lawrence Erlbaum . Howard, J. (2002). Technologyenhanced pro jec t-based learning in teacher education: Addressing the goals of transfer. Technology and Teacher Education, 10 (2) , 343-364. Topper, A. (2004). How are we doing? Using se lf-assessmen t to measure changing teacher technology literacy within a graduate educational technology program. 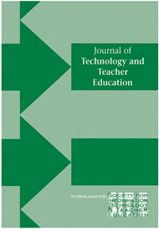 Journal of Technology and Teacher Education, 12(3) , 303-317. U.S. Department of Education (1998). Twentieth annual report to Congress on the implementation of IDEA. Washington, DC: Author.